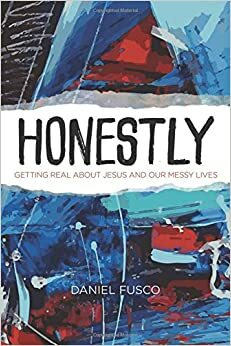 Daniel Fusco wrote Honestly with the intent to "Get real about Jesus and our messy lives." We all live messy lives because we're all messy sinners. No one lives neat, sinless lives. Fusco reminds readers that while life is messy, we are not alone in the messiness because "Jesus is a gift for the mess" (73). It is impossible to avoid the messiness of life, but if we acknowledge that Jesus is the answer to the mess, our lives will look different. Jesus doesn't eliminate the mess, but he dwells within us as we navigate the mess with His guidance. Honestly is broken down into four parts, with each part broken into subsections. Each subsection begins with a passage from Ephesians. Throughout the book, Ephesians is explored in detail as Fusco explains life's messiness. Each subsection ends with one or two reflection questions that enable readers to spend time personally applying what they have read to their own lives. Fusco writes with a conversational tone that makes Honestly an enjoyable, easy read. Fusco makes bold claims that he alwats backs up with Scripture, but he sometimes paraphrased the Scriptures. While he always pointed out when he has paraphrased it, some of the wording he used to retell the Scripture made it seem like he was changing what the passage means. While I do not think this was his intent, it is something that I did not like about the book. Overall, Honestly is a wonderful book that gets Christians talking honestly about the struggles we face and the truth that Jesus meets us in the messiness. I received a copy of this book from Tyndale in exchange for this honest review.